banaras ka khana: Ajwaini Arbi ki bhujia...Colocassia stir fry..
Ajwaini Arbi ki bhujia...Colocassia stir fry.. 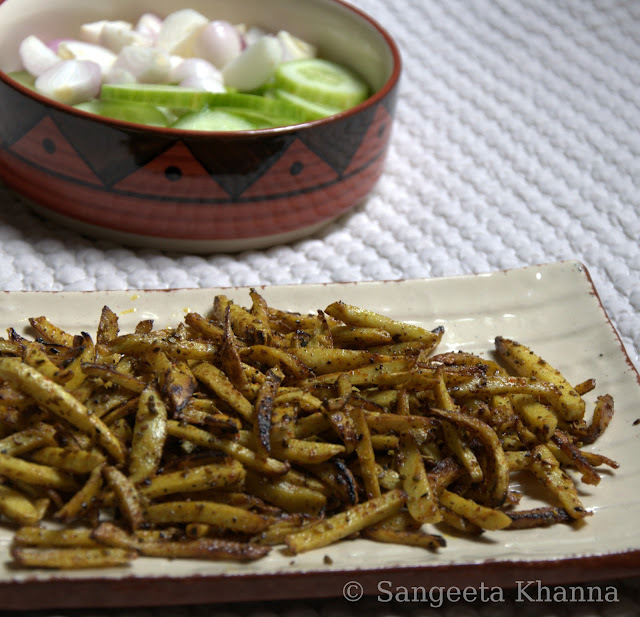 I can't believe I haven't posted a proper recipe with Arbi (Colocassia roots). Just one wee recipe of green coriander paste Arbi way back. I don't have much bonding with this boring looking vegetable as it has no green shades. The Arbi leaves are loved at home very much and the Patra or Girmach made with the leaves is a perennial favorite. My problem with this vegetable in the root form is just that it is not green in any way. Although Lotus stem is same in that regard but I love that more than anything. I like Arbi too but only in dry stir fry kind of bhujia. One is this Ajwaini bhujia which is made using raw Arbi. 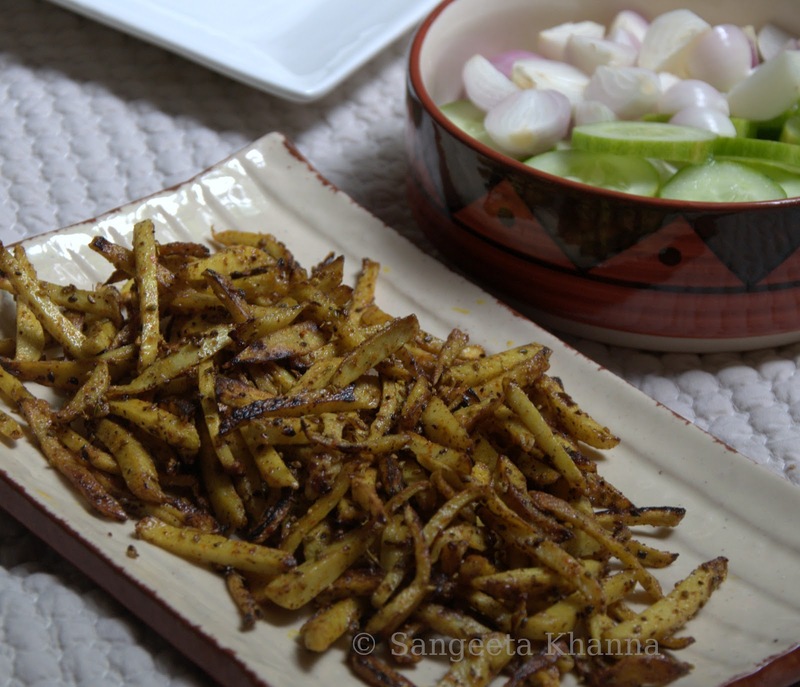 Another is a fried garlic infused bhujia that is made using boiled Arbi. The Garlic one will be posted later sometime whenever I am tempted to buy some Arbi again. This one with lots of Ajwain seeds is nice with a daal chaawal meal. Some usual raita and salad on the side is good enough. Scrape the skin off the Arbis and wash them. Scrub them clean. You might like to wear kitchen gloves if you have sensitive skin like mine. Slice them thinly in batons. Try to make as thin sticks as possible as it helps in absorbing the flavors better when it is fried this way. Heat mustard oil in a pan and tip in the sliced Arbi as the oil gets hot. Fry for a couple of minutes and add the Ajwain seeds and salt. keep stir frying or tossing on medium low flame till the slices are lightly browned and lightly shriveled. This can take about 10-15 minutes. Add the dry spice powders and toss well. Cook for a couple of minutes and take off the flame. You might like a squirt of lime juice over this bhujia as the itchiness caused by Arbi is nullified by lime juice. The generous quantity of Amchoor powder also helps but you can have more souring agents than one for this. I used my homemade amchoor powder only. Let the bhujia rest for at least an hour before serving. This is not the usual aloo bhujia which you eat crisp and fresh. This one can scratch your throat like anything if you don't allow the sour acids neutralise the Oxalic acid crystals in the Arbi tubers. Consumed the next day, it is the best. Tastes almost like pickled. This is a tasty bhujia for UPites. All the daal chaawal lovers I know. Thanks for this new awesome recipe. Just wanted to bring to your notice that many photographs from your blog posts are currently not available. For e.g. I wanted to check out Paneer Pasanda recipe at (http://www.banaraskakhana.com/2010/05/paneer-pasanda-step-by-step.html) but all the photos are replaced by black exclamations. Can you please look into this? Congratulations. Your understanding of the chemistry of this vegetable, makes this dish stand apart from others. Great article.